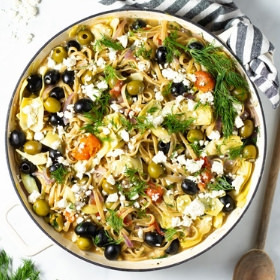 This 20 minute, one pot Greek pasta is loaded with veggies and all your favorite Mediterranean flavors of olive oil, fresh dill and feta cheese. Add linguine, broth, onion, olives, tomatoes, artichoke hearts and garlic along with a couple large pinches of salt and a large pinch of pepper. Stir to combine. Turn to high and bring to a simmer. Simmer, uncovered, over medium low heat for 10-12 minutes or until pasta is al dente and most of the liquid has been absorbed. Stir in fresh dill and feta. The feta will begin to melt and mix with the remaining pasta water, coating the noodles in a light sauce. Garnish with fresh dill and a bit more feta and serve!